Twinery Verb Kemper Profile Pack is now Free!!! 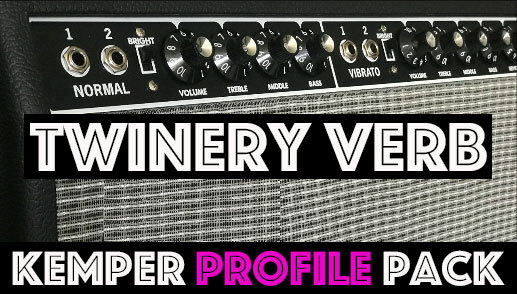 The Twinery Verb Kemper Profile Pack from Tone Junkie faithfully captures the tones of the iconic 100W 2x12 American clean machine from about 1 million popular recordings. These are the Flagship sounds that put that little shop in Fullerton, Ca on the map as an amp maker back in the 60's. You get 20+ profiles of the normal channel (N) , normal channel with bright switch (NB), vibrato channel (V), vibrato channel with bright switch (VB) and some cool stomp boxes thrown in. We also went with a new technique for this pack, instead of signature Cascade Fathead II and SM57 into pres set up we opted to use the Ox amp top box. We think it sounds pretty killer! Twinery Verb Pack is now included in our new "bigger and better" Free Pack. Sign up below to get the Twinery Verb and everything else included in the Free Pack for Free!! !